DINET is a global messaging platform that allows you to safely exchange messages, such as orders, invoices and packing slips, with your business partners worldwide. It supports various message standards (such as ODETTE, VDA, EDIFACT, ANSI and EAN) and communication protocols (such as (S)FTP, AS2, OFTP(2) and X.25). The greatest advantages of this system are its speed and the cost savings it makes possible. DINET is, simply put, a global message converter. In order to send and receive the messages, you use a network connection, such as a dial-up connection. 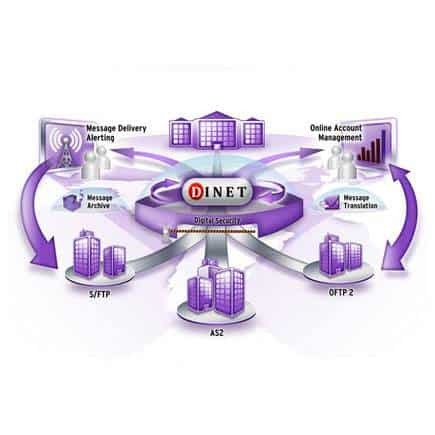 DINET works according to a mailbox system and the Value Added Network (VAN) principle. This way, businesses can communicate with one another at a chosen time without needing all kinds of communication protocols. Would you like to know more about DINET, our Value Added Network? Our EDI experts are happy to help.